(1966) Groundbreaking for the World Trade Center. (2000) Windows on the World is the highest-grossing restaurant in the United States. (2001) The WTC site is destroyed. (Early 2002) The Port Authority and the LMDC begin the process of seeking bids from architects. They require the original streets prior to the WTC be restored, and they support Mr. Silverstein's lease, which requires replacing 10 million square feet of office space. (May 2003) There are over 5000 World Trade Center Site Memorial Competition submissions, including a facade submission by Ken Gardner. (August 2003) The WTC Memorial jury will select up to eight finalists, who will receive over $100,000 each to refine their designs more fully ("to develop models and three-dimensional computerized designs"). A winner (from among the finalists) will be announced at the end of the year. "After literally hundreds of hours of study of the WTC site, architect Herbert Belton and I concluded that the appropriate solution for rebuilding is to design facade-based memorials and new Twin Towers. Our plan employs all of the latest technologies in skyscraper design and restores the skyline to its former glory with the familiar iconic silhouettes. Building new advanced versions of the Twin Towers would not only provide one of the most powerful remedies in healing this country so deeply hurt by the 9/11 tragedy, but the towers themselves would become one of the most successful developments and tourist attractions in the world. Restoring our skyline with modern Twin Towers would represent not only the resilience of a great nation, but also the "bigness" of New York, which is what has always attracted visitors to the this city. Each floor plate covered one full acre. The current plan put forth by the LMDC is much less significant. Mr. Libeskind and Mr. Childs are trying to invent a new icon. I believe that icons evolve. The original towers were not very popular when they were first built, but they became one of the great symbols of this country over time. Elements of these buildings symbolize this country and always will. If for any reason the Capitol building were to be damaged or destroyed, I cannot imagine replacing the magnificent dome over the Rotunda with some kind of twisted trapezoidal or fortress-like structure. Yet this is what has been planned for the Freedom Tower. Herbert Belton was a junior architect at Emery Roth & Sons on the original World Trade Center site. He was licensed in New Jersey, Pennsylvania, and South Carolina, and was a project manager at New Jersey Bell, manager of design and construction at AT&T, and worked for Johnson Jones Architects in Princeton, N.J. He died on November 29, 2005. Ken Gardner is a model fabricator for some of New York's largest real estate projects. He built the models shown on this website. (June, 2004) The LMDC selects four arts groups for the site. (May 5, 2005) The governor orders a complete redesign of the Freedom Tower, to be done in seven weeks, which results in the original design being scrapped for a completely different design by a different architect. The public basically believes the modifications are minor, for "security reasons." A Pataki ally says, "The governor doesn't have any choice. His whole career is gonna come down to this project." (May 18, 2005) Donald Trump advocates new Twin Towers and conventional memorials for the WTC site. 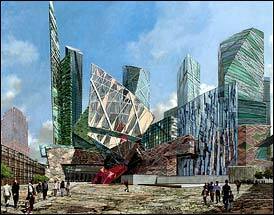 (February, 2007) Governor Spitzer unenthusiastically decides to proceed with the Libeskind "plan". (May, 2008) Governor Paterson appoints Chris Ward Port Authority Director, who commits to the Libeskind plan. (March, 2011) "We do not build vanity projects at the top of tall buildings. We are committed to finding the highest, best and most practical use for this space - one that does not require subsidizing a restaurant with public money for years to come." — PA Director Chris Ward, announcing that plans for a new Windows on the World have been scrapped.